Our lives are marked on our skin. Whether it’s freckles from a summer spent in the sun or a tattoo from our younger years, our bodies act like a map of our experiences and stories. But what happens when we’re no longer happy with these ‘stories’ showing on our skin? Introducing the new PiQo4 from Lumenis. With the advanced and powerful picosecond laser, treatment and removal of pigmentation issues including age spots, sunspots, melasma, and tattoo removal has been revolutionised. With a large laser spot — ranging from 2 mm to 15 mm — the PiQo4 allows for an increased area to be targeted, significantly reducing treatment time and allowing for faster results overall. PiQo4’s larger spot sizes allow deeper penetration into all layers of the skin, meaning the pigment is more easily dispersed. Plus, combining a larger spot size with a lower laser fluence has been shown to reduce scarring, blistering and discolouration. Want to see the PiQo4 for yourself? Lumenis is proud to be hosting a Symposium with practising dermatologist Dr. Krystle Wang at this year’s AMWC Conference, Monaco. Come along and see this revolutionary technology on Thursday 5th April, from 4:30 to 5:30 (Room: Genevoix). With the Lumenis PiQo4, clearing skin to pave the way for more confidence in your appearance has never been more achievable. 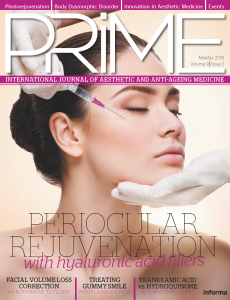 We’ve sat down with Dr. Krystle Wang, a practising dermatologist who has been treating patients with pigmentation issues for over 8 years and has been using the PiQo4 since October 2017, to find out more. With a legacy of innovation, Lumenis has over 220 registered patents and numerous FDA clearances, their global reach sees over 80,000 Lumenis systems in use with a presence in over 100 countries. The brand’s commitment to research and development has led to strong support and partnerships with KOL’s internationally.